Known to medical professionals as arthralgia, joint pain is a common health condition that is characterized by swelling, stiffness as well as mild or severing aching in a person’s joints. The pain can result from minor injuries, bruises, disorders, illnesses as well as tumors. To avoid experiencing chronic conditions that are related to joint pain, it is important to identify the symptoms that require patients to ask for immediate medical assistance. In addition, patients should also undergo diagnostic tests recommended by experts to identify the underlying cause of arthralgia. Like other health conditions, the symptoms of arthralgia differ on the cause of the pain. Severe and chronic inflammation in the lower, upper, right and left parts of the joint is one of the indications that the pain was caused by a serious injury or disorder. Swollen joint accompanied by sharp and stabbing pain whenever the joint is touched require patients to ask advice from professionals. Another alarming symptom is sudden and dull pain in the tendon and ligament surrounding the joint. If a patient experiences any of these symptoms, it is best to undergo medical examinations to diagnose the cause of the problem. Arthralgia can result from minor to severe injuries and diseases. 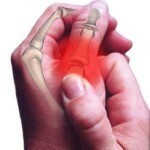 Some of the usual causes of this pain are osteoarthritis, sprains, strains and fracture. Other causes include septic arthritis, tendonitis and influenza. Aside from these, arthralgia indicates serious medical conditions such as hepatitis, lupus, measles, mumps, rubella, varicella, Lyme disease and Epstein-Barr Viral Syndrome. Above all, joint pain can result from the development of different autoimmune illnesses and musculoskeletal symptoms like rheumatoid arthritis, bursitis, Chondromalacia Patellae, gout and osteomyelitis. To properly diagnose the underlying cause of arthralgia, physicians or other health professionals usually perform advance and efficient methods. One of the most common methods is the use of computed radiography. In addition to this, patients are also recommended to have an x-ray of the affected or swollen area. To make sure that the findings are true, physicians also perform thorough physical examination of patients. Moreover, doctors review and assess the medical history of patients. Some of the treatments recommended by medical doctors to relieve joint pains include the use of immunosuppressants and antibiotics. Aside from these, patients can undergo surgeries like the joint replacement surgery if the condition was caused by a serious disorder, injury or disease. Other treatments that patients can try are stretching exercises, prescription medication as well as massage therapy.